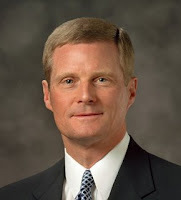 Elder Bednar is probably my favorite apostle (is that allowed??)! I knew he was destined for greatness when he was the President of Ricks/BYU-I. I sometimes snuck into his Q&A FHE sessions even when it wasn't my ward's turn just so I could hear him! That is one smart and inspired man. I was so excited when he was made an apostle (I was on my mission at the time). So when my cousin's letter this week spoke of Elder Bednar, I read it immediately and thought I'd share her notes with you (I hope she doesn't mind...all I changed was a little formatting for ease of reading). "Well, i dont have a lot of time, but i wanted to tell you a little about Elder Bednar coming. First of all, it was a question answer session. So that was nice. I got a few main points out of it. One, (he gave this answer in all his other firesides too) if you want to know more about anything in the gospel, especially Christ or the atonement, read the Book of Mormon as many times as you can in 6 months and at the end write a one page summary of the atonement (or your topic). He says hes done this thing over 20 times and gains a bigger and bigger testimony everytime, and promises that it will work. Another thing he said that we have to master in this life is how to 1)Do everything that we can possibly do but at the same time 2) "Get out of the way"...the Lord will do his work through us, but we have to get out of the way and let our pride down and know that we are simply tools in his hands. The last thing he really emphasized is that we must focus our lives on "why? "....which is the doctrine of the church. We too often only focus on/teach our children how or what, which is good, but if they dont know why, they will fall! He prophecied that to us that we will fall, our investigators will fall, and our children will fall if we dont teach the why. So i have the same invitations to all of you! Make sure we are asking the right questions in our studies, and teaching the right stuff. Also, work as hard as we can, but also get out of the Lord's way so he can do his work. I know this is God's work, and if we just stop and take a look, we will realize that if we weren't here the work would keep going, and we should just feel lucky enough to be used as a tool in His hand, and feel blessed to be able to receive the many blessings He is constantly giving us." Wow good stuff. I'm assuming this is from Jessica? (I don't really have time to read all their letters). I don't understand this guidance: "Do everything that we can possibly do but at the same time"
I don't read them always either, but this had Elder Bednar in the subject line so I couldn't resist! Oh, and I don't get that counsel either. We'll have to write and ask her what it means. i love the part about asking why. great advice. makes sense because as children grow they go through the what's that stage and then get to the why stage? much more important question. What great counsel! I love the part about teaching the "Why". In doing so, it gives our children, and grandchildren, a greater understanding of God's love for us!